How I wish we photographed the rhubarb before harvesting. Not only is rhubarb consumable, but it looks gorgeous in the yard; it gets to be quite tall and vibrant. It’s so pretty in the backyard that I’m always saddened just before harvesting — then I remember all the deliciousness that will come from it: rhubarb pie, nectar, jam, chutney, turnovers. This year my nieces have been enthusiastic to be included in our first attempt to grow a vegetable garden. The last photograph is of our niece Isabella, 3 years old, smelling what we think was about 30 pounds of rhubarb. To harvest rhubarb, grasp the stalk near the base and twist and pull out. 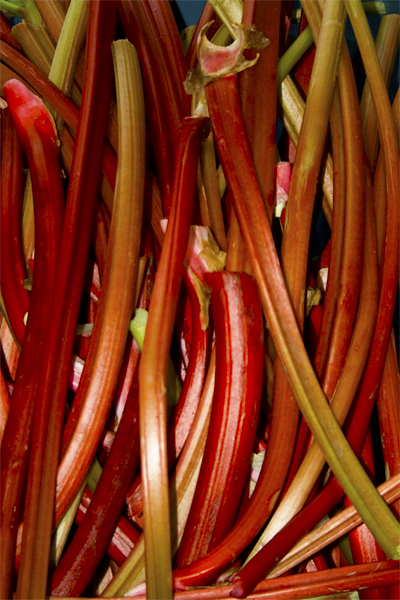 Never cut rhubarb stalks from the base with a knife as this can aid in the formation of rot. If the leaves are quite large, you can cut them off the top of the stalks with a knife as long as you will be freezing them quickly. Or, if you intend to store the stalks in the refrigerator for some days, only cut off two-thirds of the leaf. The remaining leaf will help to keep the rhubarb crisp until you use it. Remember, never eat the leaves of the rhubarb plant as they are highly toxic.